I consider myself a coffee connoisseur. I absolutely love everything about coffee. In the summer, though, it’s too hot to drink coffee past my morning cup (or two) so I enjoy a good iced coffee (or two or three). 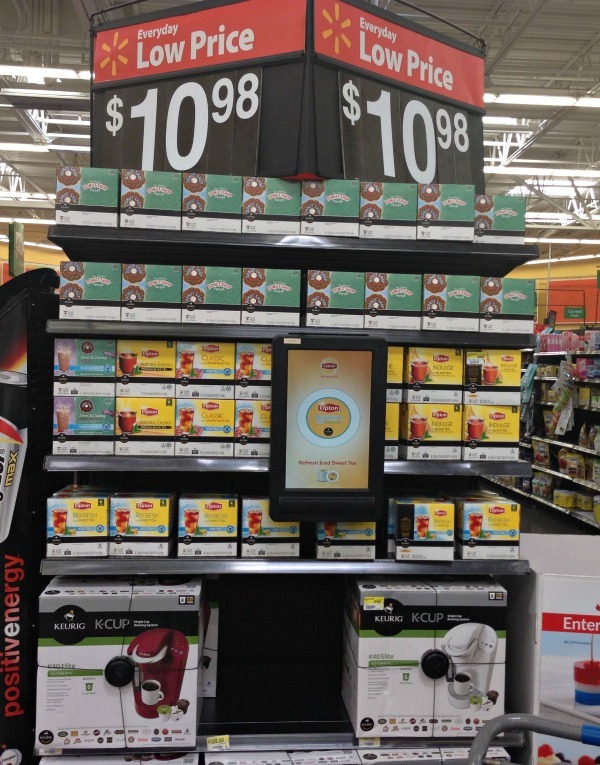 I stopped at Walmart the other day and saw their display of brewed over ice K Cup coffees and teas. They had a nice selection of the best K Cup flavors to choose from, so I grabbed a couple of boxes. I actually got a bit giddy. 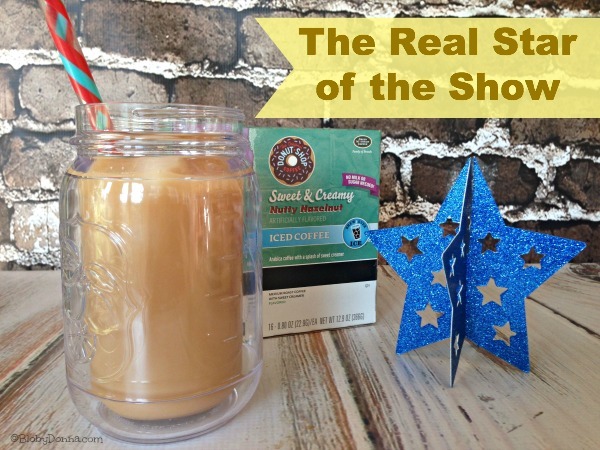 I purchased Donut Shop Sweet & Creamy Regular Iced Coffee and the Donut Shop Sweet & Creamy Nutty Hazelnut Iced Coffee to use in a hazelnut cupcake recipe I wanted to try for the 4th of July. Yes, I did say recipe. I had an idea to make a dessert, and cupcakes are always a hit, using iced coffee. I knew the brewed over ice K cups would work perfectly. I decided to make Hazelnut cupcakes with a Hazelnut Cream filling and Hazelnut white frosting. I cheated with the cupcakes by using a box mix and substituting the 1 1/4 cups water for 1 1/4 cups Donut Shop Sweet & Creamy Nutty Hazelnut Iced Coffee, but the cream filling and icing are made from scratch. Using a box mix did not affect the yummy hazelnutty goodness of the cupcakes, I assure you. Check out the recipe and try it for yourself…. Follow the directions for the cake mix, but instead of water, substitute hazelnut iced coffee. If you’re making your own cake batter, substitute the iced coffee for the milk. Whisk the flour and milk together and cook in a small saucepan over medium heat until thick. This will not take very long at all. Be sure to whisk constantly. When thickened (it will be the consistency of custard) strain with a mesh strainer into a small bowl. Cover with Saran wrap and let cool completely to room temperature. Once the milk mixture is cool (about 15 minutes), cream the butter and sugar together in a medium bowl until light and creamy. Add in the flour/milk mixture and the hazelnut iced coffee and beat with an electric mixer for approximately 7 minutes (I set a timer) until light and fluffy. Scrape into a pastry bag (or a freezer bag with the corner cut off (which is what I did) and set aside until ready to fill your cupcakes. After cupcakes have completely cooled, you can use a knife to cut out a whole in the center of the cupcakes. I used a cupcake corer I bought from Walmart to core out the center. Squeeze the cream filling into the holes and take the piece of cake your cored out and cut off the ends so that you have just a thin layer to lay on top of the filling. Whip cream on high speed for 1-2 minutes until fluffy (for best results freeze or refrigerate mixing bowl and whisk attachments — I put mine in the fridge when I started making the cupcake batter and filling). In a second bowl mix together on low speed the cream cheese and powered sugar. Increase speed slightly and beat in the hazelnut iced coffee. Keep refrigerated until ready to use. Then scrape into a pastry bag (or a freezer bag with the corner cut off (which is what I did for the frosting, too) and frost your cupcakes after you’ve filled them with the cream filling. 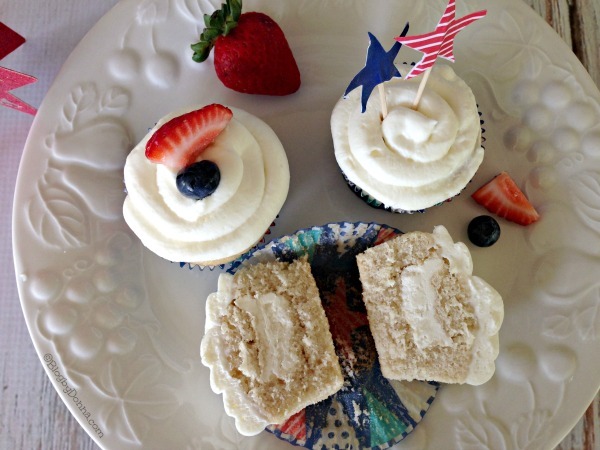 They were a huge hit on the Fourth of July. I did have a couple left to enjoy the next day and have already been asked to make some more. Soon. The cupcakes turned out so moist and the over all flavor was a nice subtle hint of hazelnut. Enjoy a Hazelnut cupcake with a Hazelnut Brewed Over Ice Iced Coffee… heavenly! NOTE: All the above recipes can be made substituting K- Cup French Vanilla Iced Coffee or vanilla extract (or vanilla beans). We really enjoyed the hazelnut flavor. I am thrilled to be able to make refreshing, creamy, low calorie drinks this summer. 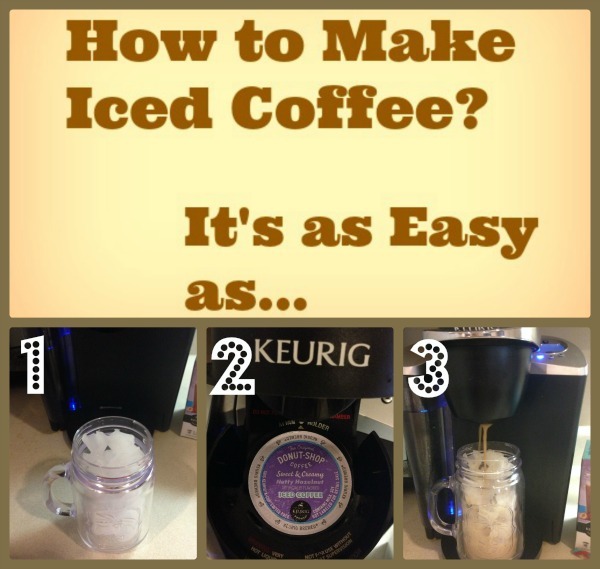 How to make iced coffee? It’s as easy as 1) Add ice to a plastic or ceramic tumbler or favorite mug, 2) Put your K-Cup into your Keurig, and 3) Press the 6 or 8 oz. button on your Keurig. Stir and enjoy! Oh, did you know Keurig has it’s own recycling program for use with K-Cups? They sure do! The Grounds To Grow program offers a way for K-Cup users, like me, to return used cups for processing that separates grounds for compost and plastics for re-use. Check out the Grounds To Grow program to learn more about this awesome program. Just one more reason to love my Keurig and K-Cups. 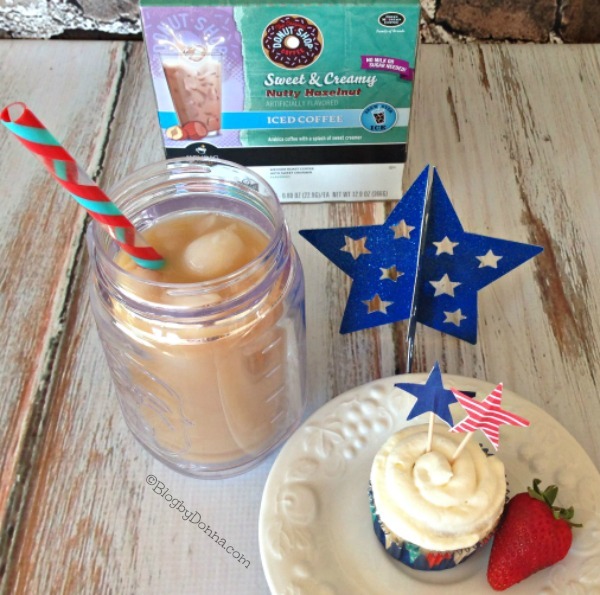 Look for the blue label Brew Over Ice K-Cup selections at your local Walmart store and enjoy a refreshing #BrewOverIce coffee, iced tea and low calorie drinks this summer; or maybe try using them in a recipe like I did… you will be glad you did. I know I can’t wait to try French Vanilla cupcakes using Donut Shop Sweet & Creamy French Vanilla Iced Coffee, next. Okay, I’m off to brew me another hazelnut iced coffee, grab the one last cupcake I hid away (shhhh….) and go out on my patio to enjoy this beautiful summer evening. What’s your favorite Iced Coffee flavor? Kcups are really great to use. I just started using my Keurig and it’s been a lifesaver. This sounds so good. I love using coffee in cake recipes. Thank you for posting. It never dawned on me to do even do that! Those look so good! I’d have to make them with decaf coffee, though, since I can’t have the caffeine. Nothing like using a shortcut – there’s no shame in boxed mixes! I’m sure the Donut Shop Sweet & Creamy Nutty Hazelnut Iced Coffee made the cupcakes amazing! I agree! No shame at all in boxed mixes! Those cupcakes look so incredible! Thank you so much for sharing the recipe. What a delicious sounding cupcake. Hazelnut is one of my favorite flavors. I couldn’t live without my Keurig! now that’s a party, I want to attend. 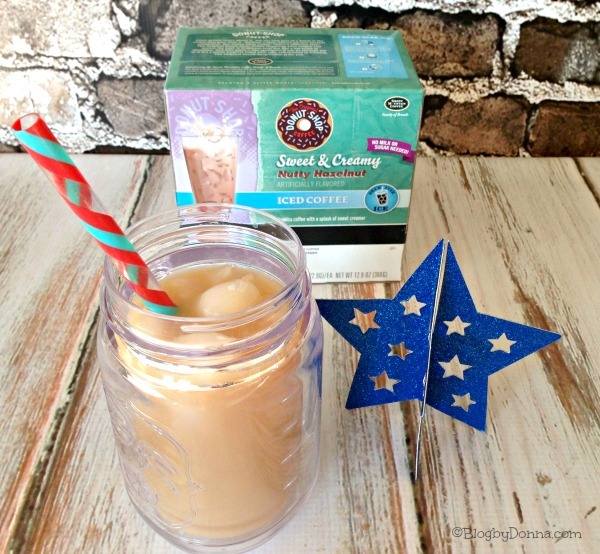 I love the Brew Over Ice cups – they are so handy to use when one has a party too – that way everyone can have what they want, iced tea or iced coffee or lemonade or a fruit brew…it’s great! Donut Shop is my favorite k-cup hands down!! Such a great idea! I loooove coffee and cupcakes, but hadn’t thought to combine them. Oh my goodness! Looks like I’m not going to sleep tonight! I am going to be hopped up on cupcakes and coffee! Definitely making these…as soon as I get back from the store! Mmmm, those hazlenut cupcakes look great. I think I am going to make them for our next food day. Thank you!!!! I am not a coffee drinker at all but I love how easy it was to add coffee to this with the Keurig and K-cups! I don’t live near a coffee shop. It’s so nice being able to make ice coffee at home with my Keurig. Oh the Donut Shop Hazelnut is a STAPLE in this house. Love it love it love it. Those hazlenut cupcakes look yummy; thanks for the recipe! I’m not a big coffee drinker, but my mom loves iced coffee. I got her a Keurig a few years ago and she loves to try new flavors. I just adore my Keurig! I love using the coffee in recipes and your cupcakes looks so good. I just adore hazelnut anything. I LOVE my kerig! And I also use coffee for things- especially for making brownies. These cupcakes look amazing! I am a big coffee addict and I would never think to use a Kcup in a recipe. Such a unique and delicious idea! I’m drinking Keurig coffee right now. I never got into iced coffee. When it comes out of the Keurig it melts the ice cubes right away! Looks yummy, I really love making iced coffee with my keurig, nothin better! There’s nothing better than coffee AND iced coffee from the Keurig for sure! Those hazelnut cupcakes sounds divine! I’ll have to try them out sometime. I am totally craving those cupcakes now. I never thought to do anything like that. Love it! I am not a coffee drinker, but I am definitely a cupcake eater, and those sound delicious. Will have to give it a try! I drink coffee all the time and I love incorporating it into recipes! Those hazelnut cupcakes look like they are to die for! Thanks for sharing! I love our Keruig. I’ve been meaning to try the iced versions but have not yet. Think summer is a great time to try it ouot. I never thought to use a kcup for a recipe…will definitely be trying coffee in my baking! Thanks for sharing. 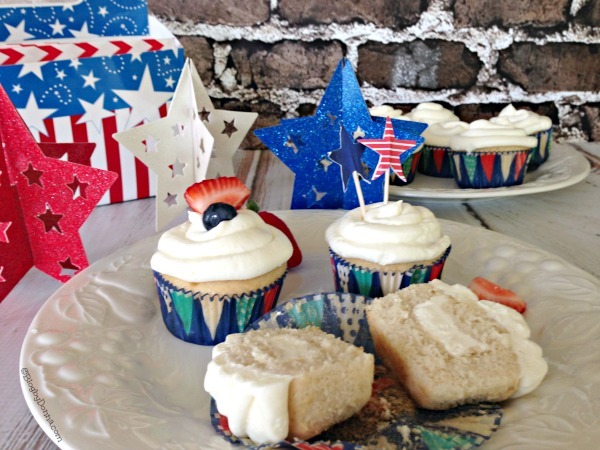 We love our K cups for drinking but never thought about using them for baking! Very interesting and neat!